More and more OEMs and research facilities are turning to epoxy feedthroughs for their vacuum chamber challenges. New epoxies are available that rival glass and ceramic feedthroughs in performance. Faster prototyping, and lower short-run costs are making epoxy feedthroughs very attractive. 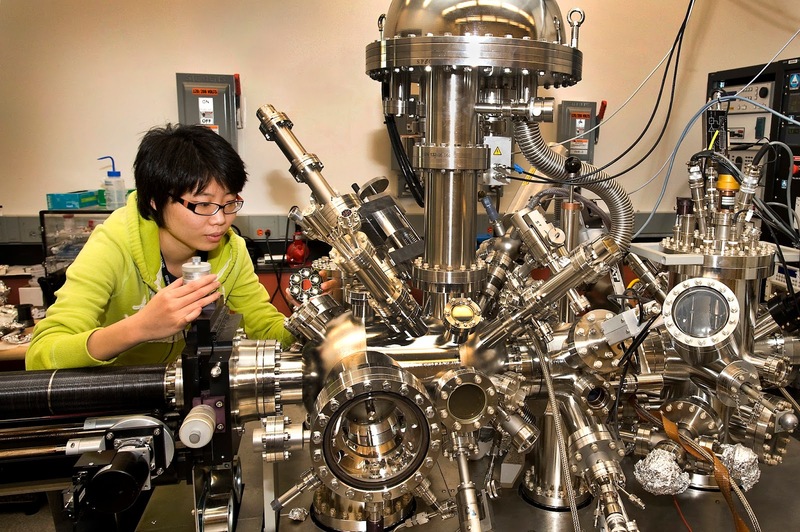 Ceramic and glass-to-metal feedthroughs typically are not available in the exact form required by scientific researchers and equipment manufacturers. There is a tendency to settle or accept off-the-shelf feedthroughs as a compromise, thinking that custom ceramic or glass feedthroughs in small quantities would break the bank, not to mention take forever to deliver. Not true. Epoxy vacuum feedthroughs come custom built to your unique specifications and ensure your equipment performs to the level you specify, so it's important to work with an experienced, capable manufacturer of epoxy feedthroughs. In today’s ultra-competitive marketplace, working with the right partner can mean the difference between success and failure. Manufacturer’s are constantly looking smaller, more compact parts, with faster deliveries and lower costs. Pick a vendor for your vacuum feedthroughs that understands this and has the in-house technology and processes to keep you ahead of the curve. Manufacturers of laboratory and process analytical equipment, as well as medical equipment, are continually challenged to make products smaller and more compact. Smaller, more efficient components are always in demand. Providing heat for sample stability or a chemical reaction is a common requirement. There's an ongoing challenge to find smaller and more efficient electric heaters. 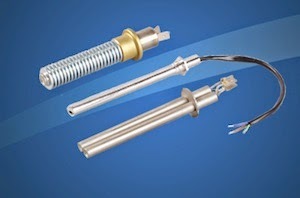 Many traditional electrical heating elements are limited in size and efficiency due to the balance required between conductor temperatures and the the heat transfer properties of the dielectric material used in their construction. Sometimes the mass required to insulate electrically is at odds with the ability to drive the heat into the part. Metal sheathed heaters use compacted magnesium oxide, or wafers of mica for dielectric. While these provide good electrical insulation, they also inhibit thermal transfer from resistance element to the external part. 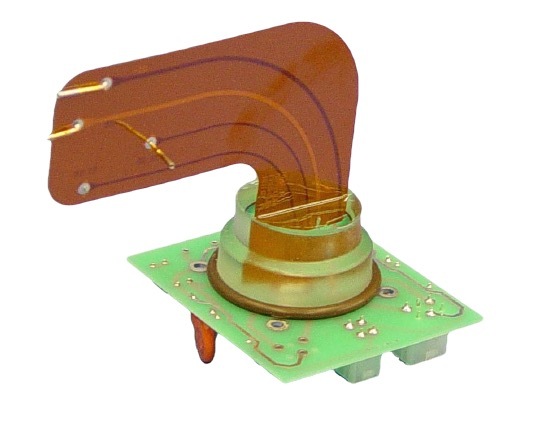 Flexible heating elements use a variety of rubbers or fluoropolymer elastomers that sandwich the resistance element. While these designs are dielectrically strong, and allow for excellent heat transfer, they are limited by the maximum operating temperatures and watt densities of the elastomer. A newer, alternative technology is “thick-film” ceramic heaters, a process of depositing a resistor “trace” of tungsten paste on top of a ceramic part in a process very similar to screen printing. The deposition process allows for close control of thickness and width of the resistor, thus accurately controlling the conductor resistance, wattage, watt density, and uniformity of the heated part. The use of ceramics as the heater body (referred to as a heated part), has many advantages. Ceramics are chemical inert, offer excellent thermal conductivity, impervious to moisture, and are very durable. The downside to using ceramics as heaters, however, is the difficulty in machining to very tight tolerances. 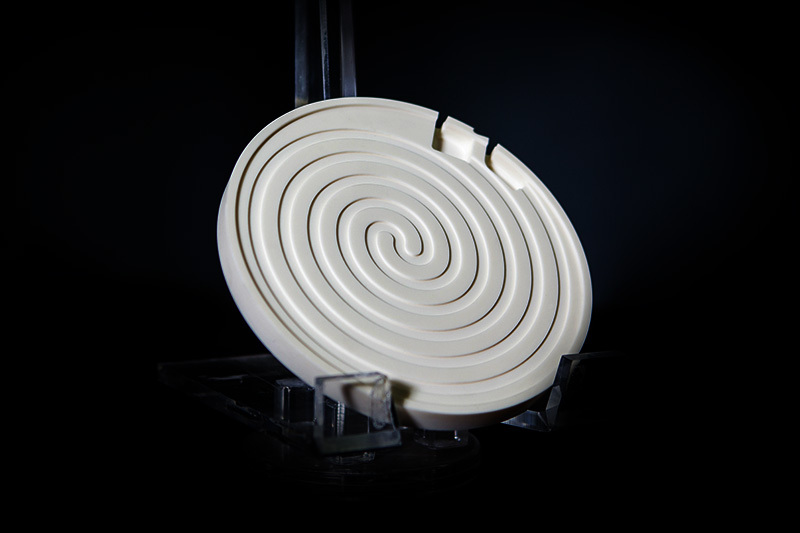 In recent years though, many of the ceramic machining hurdles have been overcome through advanced ceramic machining processes. In the early years of development thick-film ceramic heaters had a few major challenges. Dealing with mis-matched expansion coefficients between the ceramic substrate and the conductor trace was considerable. Years of research now have yielded excellent data on compatible materials making this problem much less significant. Another challenge is controlling the tolerance and repeatability of the heater resistance from part-to-part. Improvements and advancement in this area are made possible with laser etching, tighter screening procedures, and advanced machining. The use of ceramics provided many interesting possibilities in heater design, and many materials were tested and researched. The most common ceramics used for thick-film heaters today are alumina (Al2O3), silicon nitride (Si3N4), beryllium oxide (BeO), and aluminum nitride (AlN). Each material has its own unique chemical and physical properties, but all exhibit good thermal conductivity and good dielectric properties. The combination of excellent thermal conductivity, high dielectric, high watt densities, precise thermal profiling, and custom shapes and sizes that make thick-film ceramic heaters so attractive to equipment manufacturers. Providing more heat in smaller areas is easier than with traditional heaters. Additionally, some of the ceramics used are non-contaminating and moisture-proof, making them excellent candidates for clean and ultra-clean applications. Ceramic thick-film heaters have many advantages over metal or elastomer sheathed heaters beyond just providing a more compact component. They are very fast acting, durable, moisture proof, and contamination proof. They can be designed and machined to virtually any size or shape, watt density, voltage, and distributed wattage profile. While the initial design and prototyping requires investment in time and money, the resulting product can be mass produced economically and with repeatable accuracy and quality. for your electric heater application. The rates below are recommended watt densities for use with various materials. Safe values vary with operating temperature, flow velocity, and heat transfer rates. In general, the higher the material temperature, the lower the watt density should be, especially those materials which coke or carbonize, such as oils. Watt densities should be low if a material is being heated to a temperature near where the change of state to a vapor occurs (water to steam @ 212°F) since the vapor state has much poorer heat transfer capabilities. * Maximum watt densities are based on heated length, and may vary depending upon concentration of some solutions. Watt density should be kept as low as possible in corrosive applications since higher watt densities accelerate corrosive attack on element sheaths. Consult BCE for limitations. Important: The above values are estimates. It is strongly suggested that you discuss your requirement with an application expert before you apply any electric heating element in to a process where the proper watt density is unknown. This week BCE is exhibiting at MD&M West (Medical Design and Manufacturing West) in Anaheim, CA. While the title implies medical equipment design, the exhibition also includes packaging equipment and other related equipment. The show runs Feb. 9, 10 and 11. MD&M is the world's largest medical design and manufacturing exhibition. It "offers three days of technical presentations, hands-on design workshops, demonstrations and ticks and tricks to help you stay ahead of the game in 2016." Representatives from many well-know "Medtech" companies will attend and a full 3 days of presentations are planned. Some of the more interesting titles are "The Creative Keys: How to Turn a Thought Into a Thing with Ease and Grace", "New Product Development Technologies and NexGen Applications", and "Leading the Smart Manufacturing Revolution". BCE's Applied Resistance Group will showcase its thermal system design capabilities, advanced ceramics machining, laser machining, and thick film circuits and heaters. BCE is quickly developing a nation-wide reputation as an excellent partner for these products. BCE has decades of hands-on experience with thermal systems and advanced ceramics. The result is a strong expertise in analytical instrumentation, semiconductor equipment, photovoltaic devices, medical equipment, plastics processing machinery, foodservice equipment, packaging machinery, aerospace technologies, and laboratory R&D. Exhibitions and trade shows are great places to network and build business relationships. Face-to-face contact with prospective customers and vendors provide an opportunity for strong business relationship foundations. Meeting with someone in person is far better than meeting online. One huge benefit of attending an exhibition is the ability to meet large numbers of helpful people in one place. When attending an exhibition, it's best to plan ahead and utilize your time efficiently. Set up appointments in advance so that you don't waste time wondering. Make a list of booths and people you really want to get to know. And please, stop by the BCE booth (2184) - you'll be glad you did.